Want to watch any and all content but you’ve been out of the loop? Here’s our list of Primewire alternatives. Formerly known as 1Channel and LetMeWatchThis, Primewire.ag is a streaming service that allows you to watch movies, TV series, and stream music for free. Ever since its inception, it has gained a significant amount of support from the Internet community due to the fact that it’s an all-around platform which anyone can enjoy. Piracy is never an issue before with this site, as Primewire only acts as an intermediary between the users and the sources and therefore does not host all the content found on its website. But you know the media and music industry – they are always on the lookout for potential infringement and violation of laws. When Primewire was shut down, the popular streaming site had to change domains every now and then to avoid possible detection. But not all the domains for Primewire link to the original Primewire and some are not even guaranteed to work. Users were even warned about possible malware, virus infection and phishing scams on the site. With the Primewire website being a lost cause, how can you securely understand or consider alternatives? Streaming In General – Is It Legal? You’re watching copyrighted material. Who is responsible for due diligence – you, the person who is browsing the public domain or the people behind the service? Often times, this responsibility lies with the webmasters. But this may not necessarily be the case 100% of the time. This all depends on where you live and the local laws. That’s why before you stream, use a VPN to avoid running into any possible violation of the law. It also provides an additional wall of protection for your computer from malware and viruses since you’ll be clicking a lot of links on the sites that we’re going to mention which has a lot of pop-ups and ads. With all that being said, let’s start hunting down the list for Primewire’s successor! Yes. First on the list is the heavyweight streaming site, Moviecafe. It’s not named Moviecafe for nothing. It’s a Primewire alternative which boasts a wide library of titles ranging from TV series, movies, and even documentaries! The site is easy to navigate on, because it’s the usual search, click and watch. In some cases, you’re allowed to download the content in 4K or Blu-Ray! However, as this is only an alternative, there is an obstacle before you can access the content that’s available on its site – you need to register an account. In these cases, using your private e-mail is a no-no because you might compromise your privacy and reveal your identity on the Internet. We recommend that you use a fake e-mail for your safety and protection. The site is not also secure, so for further security and added layer of anonymity, why not use a VPN? Note: The website has just had a major overhaul this month, so it may take you some time to find all the titles from the previous site. It’s like Openload, but with a bigger library. If you’ve been a Primewire fan for too long, then chances are you’ve come across Openloadfreetv. It’s like your usual Openload streaming server, but bigger, more accessible and better. 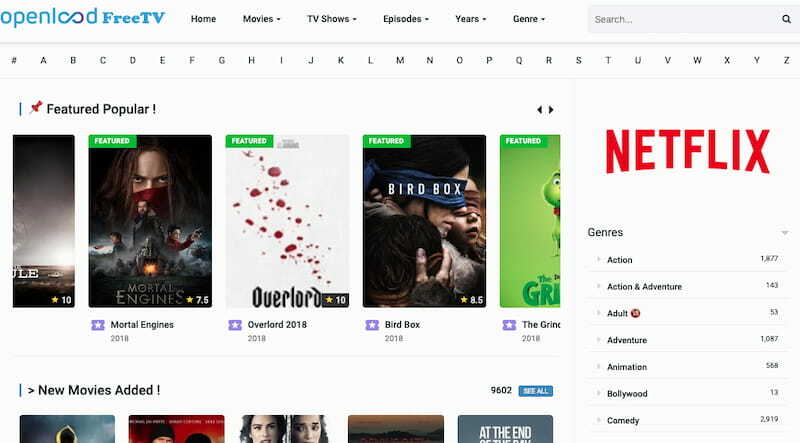 What’s interesting is that the site also presents a vast library of Netflix titles, considering that you see the word “Netflix” plastered on its home screen. It’s perfect for people who want to watch Netflix titles for free of charge. You’ll have to do some searching though, as it’s not always guaranteed to yield good results. It’s free so cut yourself some slack. The site has a minimalist feeling to it, and the arrangement of the titles it offers side-by-side is a good indication of good UX. All you need to is just search in whatever it is you’re looking for on the search bar to start watching. All in all, its a very reliable Primewire alternative. But be on guard, this site has lots of pop-ups and ads at almost every click. You may get to watch its content for free, but it doesn’t mean that you can watch it right away. We recommend that you turn on you AdBlocker in your browser to block malware and viruses from harming your computer – or just subscribe to a premium VPN which offers better protection and more! If Openload is an option, you can also bet Putlockers is. If you’re the type of person to stay all day on the Internet just to watch movies, then you might have also used Putlockers during one of your sessions. This Primewire alternative is also one of the recommended sites for streaming content free of charge. Its library offers a lot of collections of TV shows, movies and other types of content available on the Internet. What sets it apart from other Primewire alternatives is its accessibility. The content provided on its site is readily sorted out – from genre, year, popularity, and others. You can easily search for the title you want if you know one of the details mentioned above. There’s also a brief description for each, so you’ll have a little snippet of information to enable you to know if it’s the title you’re searching for. But the downside is, as with other free of charge streaming platforms, the website address changes every now and then. So savor all your time when you visit the site because it may not be available next time. Careful reminder – it’s not as infested as the others, but we remind you to enable your AdBlockers as you’ll be clicking a lot of sites and sources to find out what you’re looking for. Another dangerous thing you should bear in mind is that since you’re watching copyrighted content, then you risk breaking the law. In such cases, you should definitely get yourself a dependable VPN so you won’t get into trouble. 123movies is a strong contender for a good Primewire alternative. This Primewire alternative is also as easy as its name suggests. 1, 2, 3, movies. It’s simple as that. This site has a huge following among Internet peers which numbers to around 90 million, even becoming the greatest streaming platform at one point. It’s good stuff. It also offers features categories for filtering preferences from the genre and the date. Plus, it also has an IMDB rating provided for every title it offers so you know what’s good or not even before you watch it. But as with other free of charge streaming platforms, you should know the drill. Don’t forget to enable your AdBlocker in your browser to block harmful stuff on the website or subscribe to a premium VPN which offers better protection! The site also changes a lot and it’s recently been overhauled to provide optimized streaming for its growing fan base. If the name rings a bell, it’s because it’s the successor to the now-defunct movie2k. When Movie2k was taken down by the Motion Picture Association of America in 2013, Movie4k immediately spun out of nowhere. Now it caters to almost 1 million visitors every day, making it one of the best Primewire alternatives on the Internet. The number has doubled in the site name, but does it offer double the fun? The site has been one of the frequent targets of take-downs because of the copyrighted material it hosts on-site. You won’t be able to find this in the UK, Denmark, and some parts in Austria. If you want to access it, you have to use a VPN to bypass the ISP ban. It’s better because aside from hiding your identity, you’d be able to browse the Internet without interference. The dark interface of the website gives it a less stringent appeal to the eye which users nowadays always look for. It advertises itself as one of the biggest and easiest websites to watch online. It’s as easy as pressing play on your computer or mobile device. Like other alternatives to Primewire, this site also has lots of pop-ups, ads, and redirections. The redirection might seem like an endless process sometimes but hey, it’s what you need to do to get things for free, right? If you want to find a good Primewire alternative which is a lot less congested, go with Solarmovie. It hosts popular titles which include movies, TV series and others. What’s more engaging is that the content is actually sorted by genres and years on the right part of the website, so if you’re looking for a romance flick which premiered in 2002, you have choices where to look. Aside from its simple interface, the process to start watching is not that tedious because you’re given a video right away when you click. It does not host the content provided on its site but only acts as a middleman for both the user and the primary source, so no worries getting caught for copyright infringement anytime soon. Furthermore, this site also has fewer pop-ups and ads than others, so if you’re looking for a less interfered browsing experience, this is definitely your cup of tea. But just to be sure and safe, we recommend that you use a VPN. It’s just insurance. Vmovee is not that popular, but it delivers. This Primewire alternative may not be known to some, but Vmovee also delivers premium content free of charge which is at par, if not, better than other streaming platforms. It may not have readily available panels for sorting out the material found on its site, but the dark interface and the arrangement of the titles from recent to older ones will have you streaming on it in no time. Like Solarmovie, it doesn’t host anything on its site, rather it redirects the traffic to other sites where sources for the material is found. Like some of the sites listed here, the webmasters are sort of safe since all they do is embed the videos instead of hosting them. In any case, we advise you to use a VPN just to make sure your activity on the website is protected and hidden. 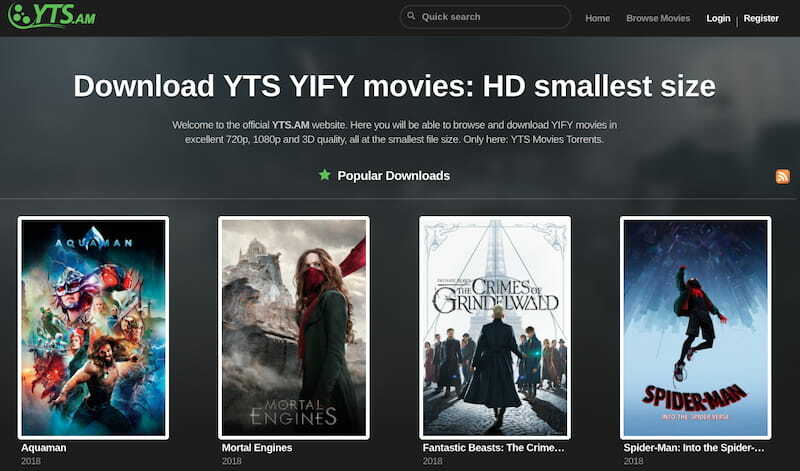 YTS – A YIFY clone with a different feel. YTS is a site which uploads high-quality material at the lowest compression size possible, so you can watch 720p, 1080p or even 3D material without having to compromise much of your storage space. If the interface seems familiar, it’s because YTS took over YIFY’s branding in 2015. They’re not related in any way, but you might find some of the content from the old site if you search long enough. During its prime, it was regarded as one of the best sites for finding high-quality videos on the Internet, even outperforming Primewire. As such, it should not be surprising that this is also included as a dependable Primewire alternative. Try Levidia for a change. 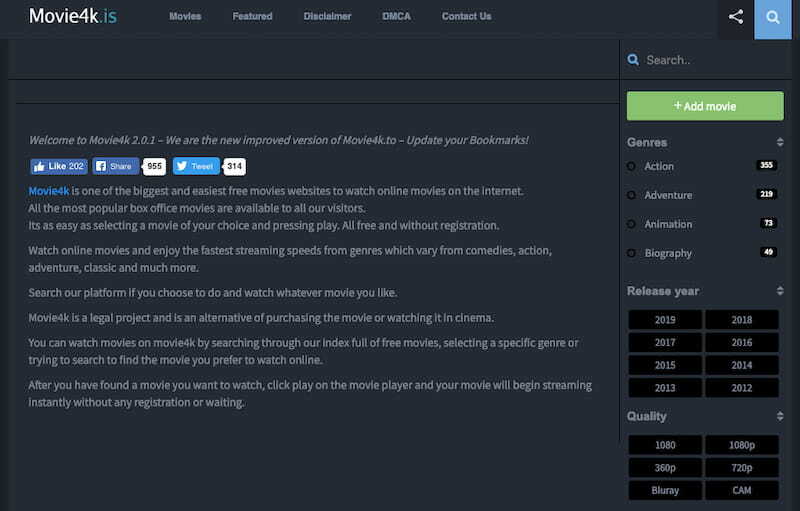 Levidia might be relatively new and less popular in the streaming market, but it’s a great addition to the long list of Primewire alternatives. At the onset it may seem like a very dull streaming platform with the very pale color of texts and little search bar, but if you stay long enough and start streaming, you’ll realize that its interface serves a purpose – it’s there so you feel less congested and you can stream freely without necessary interference. What you’ll like about Levidia is that since its relatively new, selections are uploaded every day to ensure that all links are working. You’ll be surprised at the sheer amount of choices where you can stream. It also acts as a middleman of some sort, so they’re hands-off when it comes to piracy issues. Use a VPN so that you may be protected in case of possible conflicts and to also repel malware or viruses which can come with the redirections. Afdah is also another alternative for Primewire if you’re looking for one. 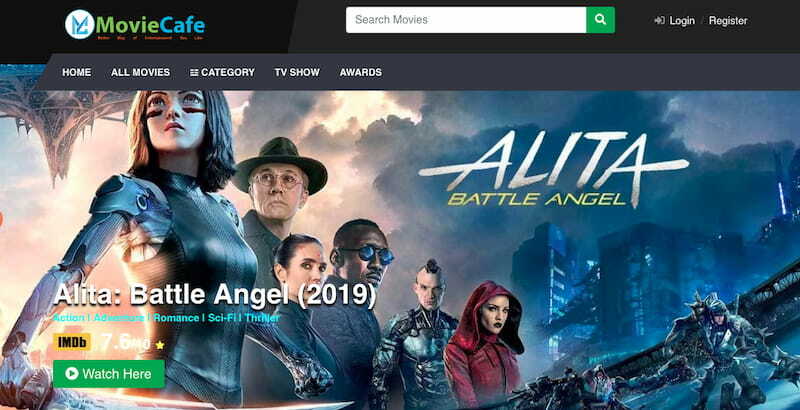 Afdah is also a free-of-charge streaming platform and has gained a significant amount of followers due to its vast library of movies and TV series. It’s known for its movie section so you won’t have trouble accessing the movies you want. You can choose to browse it by year, country and even language! Not all streaming platforms cater to such search preference even the old Primewire website. When it comes to TV Series, you’d have to wait a little while before it gets fully operational since it’s still in beta mode, but you can still search the website for some. In addition to all these, you can also use it on several types of devices like Apple and Android, it’s a certified Primewire alternative. All these options we’ve given might be free of charge, but that doesn’t mean it’s safe – from the technical side to the legal side. From a technical standpoint, it’s the constant ads and pop-ups when you visit these sites. These streaming platforms run on advertisements and pop-ups because that’s how they monetize the sites. They offer the content free of charge but all those annoying stuff you close when you click on the site are what makes them functional. Sadly, these sites come with extremely harmful stuff so you have to protect yourself. From the law’s point of view, it’s about copyright infringement. Some jurisdictions aren’t really clear about whether it’s legal or not to stream content hosted on the public web. In 99.99% of cases, you’re innocent. But what if the underlying technology behind the streaming platform uses p2p? If this is the case, you will unknowingly share the copyrighted content (download and upload), which is definitely illegal. As a result, you could be made subject to a heavy fine and possibly even jail time. Having said that, the solution to both problems is plain and simple. You should use a VPN. A VPN hides your activity from the world – which means you can browse without being detected anywhere and anytime. In the same way, premium VPNs like NordVPN also protects you from the harmful stuff that’s on the websites you visit and links you click. They come with a built-in pop-up and ad blocker. This is why VPNs are so popular nowadays. It’s a simple all-in-one solution. If you don’t know where to start, check out our top 10 recommendations for the best VPNs in the market. 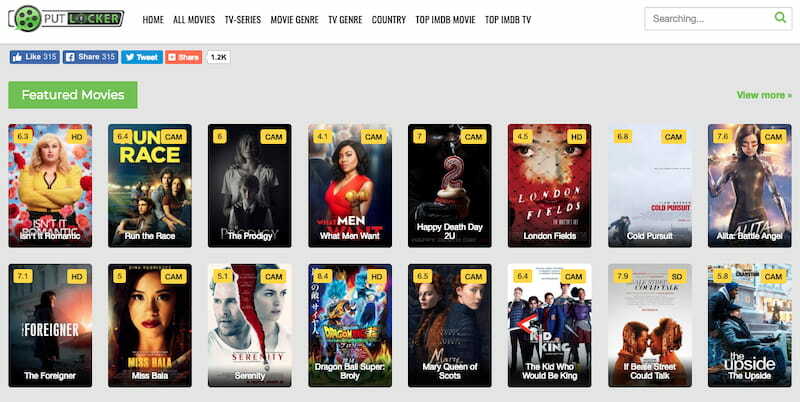 Primewire’s demise might have left a huge void to fill in the world of free streaming services, but there are several Primewire alternatives (and even mirror sites) which can do the job just as well or even better. Always remember that the Internet is not a safe place, so it’s best to use a VPN to enjoy it to the fullest. Streaming and torrenting reveals your IP to the public. A VPN hides your IP address while encrypting your activity. If you stream and torrent without a VPN, you will eventually get caught. Protect yourself and get a VPN for torrenting and streaming.